Although the monsoon brings much needed rainfall to the valley, It can reek havoc on Tucson air conditioning. Some of the more problematic conditions that come with Monsoon weather include increased humidity, high winds, lightning strikes, power outages and driving rain. These conditions can all have an adverse effect on you air conditioning system. High humidity causes condensation to form at a high volume, some units can put out over five gallons of water per day. If your condensate line gets clogged or leaks, this could lead to serious water damage in your home if left undetected. Humidity can also compound a problem caused by a dirty filter. Ice will begin to form and when the humidity is high, it develops very rapidly. 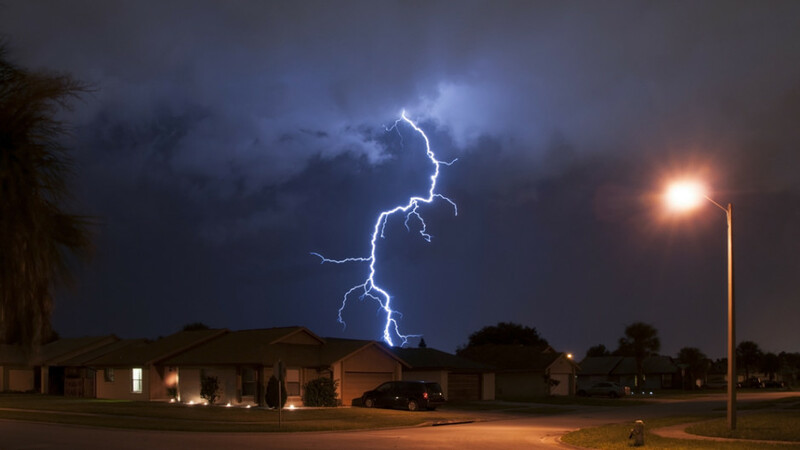 lightening strikes can cause a seriously big problem for electrical components in your A/C unit. Power surge caused by lightning can destroy electrical equipment throughout your home and create sizable air conditioning repair bills. power outages, especially brief off-on events, can cause your unit to suddenly stop and restart mid cycle causing the unit to lock out on safeties or overheat the compressor. So what can be done to protect Tucson Air Conditioning? Protection and prevention is the best cure for these monsoon related issues. High humidity related issues can be addressed with condensate safeties to shut the unit off if the water backs up. Specialized cleanable see through condensate traps make it easy for the average home owner to clean their own traps with no special tools or skills required. Changing your air conditioning filter on a regular basis can save a lot of trouble and keep your unit running at its best. You should have computers, TV’s and other sensitive electronics plugged into a surge protector. Having a surge protector installed on your A/C unit can spare you from a costly air conditioning repair. Making sure you have a modern thermostat with a built in time delay can save your unit from turning on too quickly after power is restored to your home. All of these items discussed are available from Baker’s Mobile Aire, just contact us today to find out more.